Online app for create innovative Infographics! Piktochart is an innovative infographic editor that will enable you to design presentation that will put Powerpoint and other traditional presentation creators to shame. By chosing richly designed template themes and adding beautiful graphic, your presentation will suddenly become talking point of your co-workers, clients, and friends. Powerful Infographic Presentation Tool! 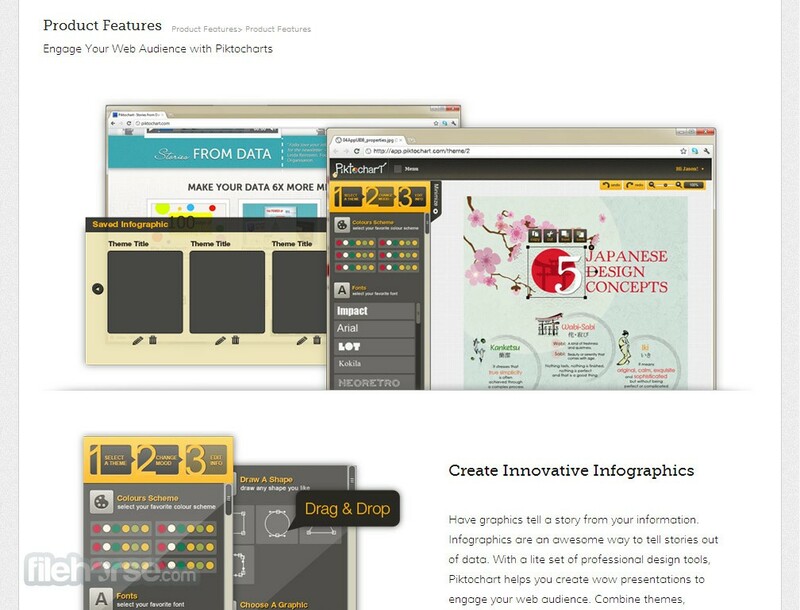 Piktochart offers its users powerful editor that can be used by both computer novices and professionals, tools that can be learned in no time, many professionally made themes, and working environment that will immediately enable you to express yourself and build fantastic infographic presentations. Everything Piktochart offers can be accessed for free, but if your work demands creation of large amount of infographic, payment tiers can give you access to much more professional themes, total control over color themes, font switches, design elements and larger storage spaces for up to 100 of your presentations. Infographics platform for all designers and novices! Anyone who has seen marketing campaigns on the internet may have noticed that infograms almost always represent one of the most engaging and most engaging pieces of content you can interact with. Packed with interesting information and formatted to look visually stunning, infograms have unique ability to instantly transfer information to users of all genders, age and knowledge levels. They can of course also be used in countless other situations, for school, work, having fun with friends and more. If you want to create infographics for yourself today, you don’t need to be a design master or even to know how to control complicated image editors. All that you need is to go and visit Piktochart, online service that enables anyone access to powerful infographics editor and integrated publishing and sharing tools. If you are interested in knowing more about this great webapp, continue reading. Piktochart is a popular web-based infographic editor and publishing platform that was built from the ground up to allow users that have zero design experience to easily craft eye-catching and interactive infograms using streamlined editor, pre-made templates, and integrated tools for infogram sharing and direct integration into SEO algorithms. This last part of its service will be most interesting to many professional users, who are not satisfied in creating infogram image or interactive element, but they also want to integrate its text and data into search engine optimization, directly increasing the chance of their work being easier discovered. Process of infogram creation on Piktochartis incredibly easy. Simply register for a free account (paid version is available, including special prices for Education and Non-Profit clients), access streamlined editor and start creating. Initially you need to pick a mood and theme of your infogram, and then start customizing it by visual objects from Piktochart’s large graphics database. Even though its editor can in the beginning look a little daunting, anyone can easily learn all of its tools and features, enabling you to create anything that you want. Finished project can be either downloaded to your PC, or immediately shared on social networks or your own website. Paid version unlock larger graphics database, more professional themes, removal of Piktochart’s branding and more. Powerful Infographic Presentation Tool! Piktochart prides itself with the promotional slogan “no design experience required”. This is achieved by with the mix of powerful editor that will make seasoned designer feel at home and large database of pre-made templates and graphics elements that novices can simply drag&drop, arrange and create their own unique infogram. It’s that easy! Users who pay premium subscription can access exclusive database of 100 premium infographic design, further more enabling their creations to look and feel unique. 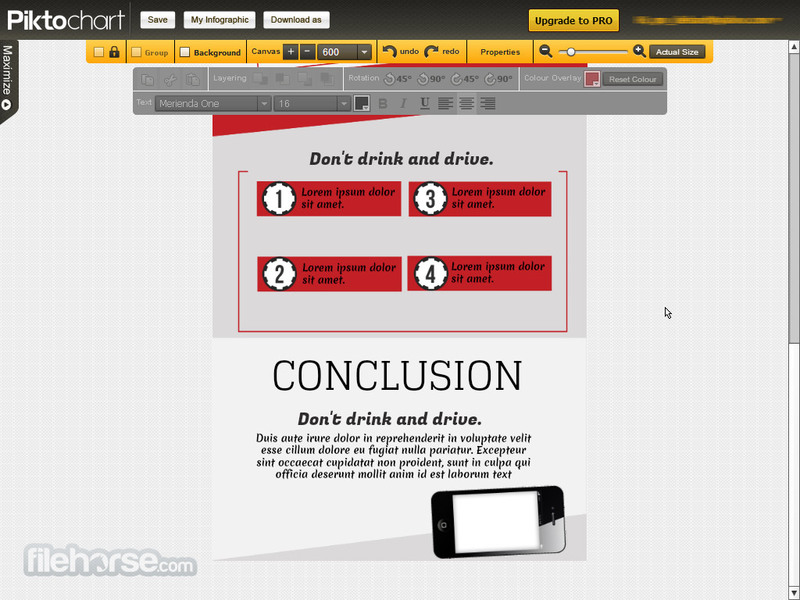 Piktochart can be used for free, but with limited access to its editor functions. Premium version that costs $29 per month ($14 if you pay for entire year) unlocks much more capabilities such as larger visual element libraries, premium themes, 200 image upload slots, export in high resolution images, removal of Piktochart’s branding and more. After just few minutes with Piktochart, you will be able to see how large potential its editor has in enabling anyone to create engaging, interactive and attractive infograms. We fully recommend you to visit their website and try the free version of their award winning service. Have graphics tell a story from your information. Infographics are an awesome way to tell stories out of data. 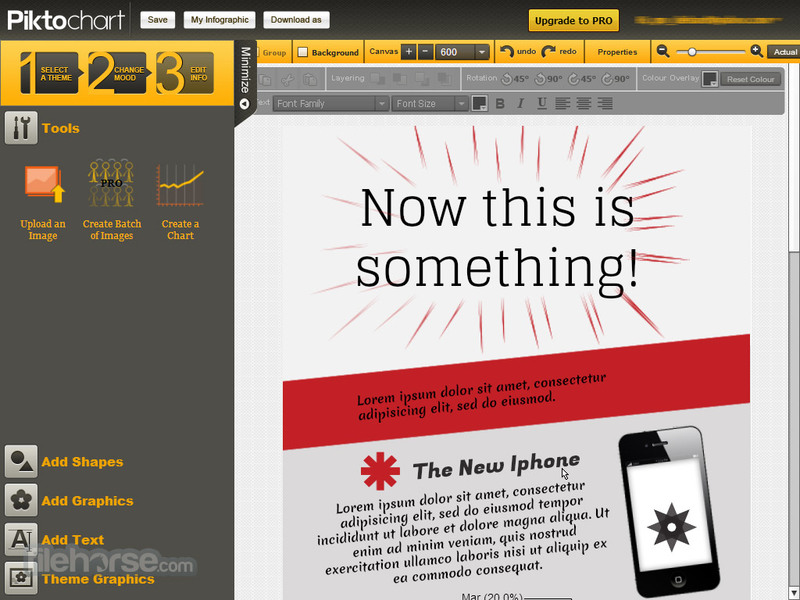 With a lite set of professional design tools, Piktochart helps you create wow presentations to engage your web audience. Combine themes, shapes, icons, vectors, text, uploaded images, chart exporter (8 types of visualizations) to create the story you want. Do not like the colours/fonts that you see? Easily modify the entire font or colour scheme in your presentation within a click. Easily export the presentations as images for you to embed in your presentations or website/facebook and etc. 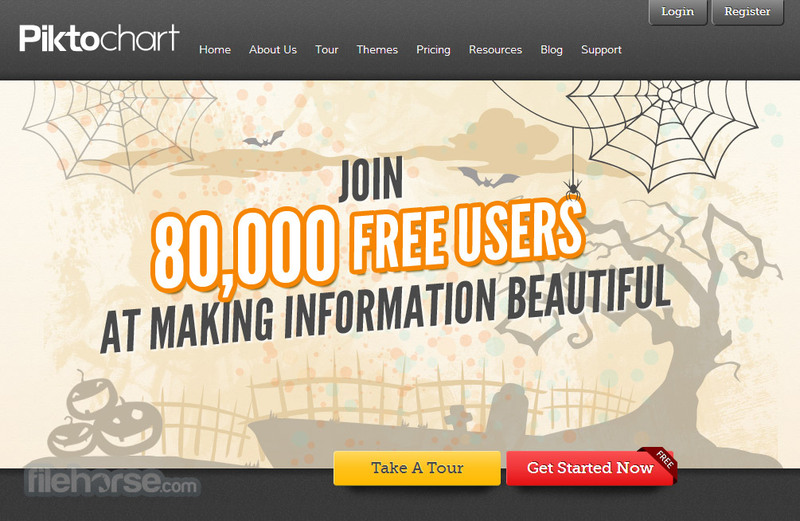 It`s working to be the first search engine friendly infographic tool. Amazing Infographic Presentation Tool! Piktochart themes have been designed for customizable use. Each of the themes appeals to a niche topic, but it`s ensured that they can be generalized. Piktochart aiming to filter them by Education, Sales/Marketing, Personal etc. Are there more that you would like to see? Definition of Interaction: Two or more objects have an effect upon one another. Piktochart helps you engage your audience with some call-to-actions to personalize what they want to read/see. Via interaction, you also collect more information about who is reading your infographic and why are they reading it.